I participated in my first ever run! With my darling E, I took part in my first ever run of any kind. 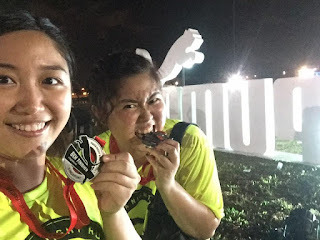 We signed up for the 6km Puma Night Race, with the intention of completing 6km. This may seem like a rather long distance, and the 12km option to be mad and grueling. However, 6km strolling with a buddy passed really fast. We completed the race in 1:15:59, and 1:16:00. xD~! yay. I think i'm becoming addicted to long long walks. Maybe next time I'll run a little. On the 30th October 2014, I was awarded with the NYAA Gold Achievement Award, and shook hands with the current President, Tony Tan. 3 years of effort, another year of waiting. I DID IT. This first-aid duty was for the eve of the Singapore International Water Festival, organised by Singapore Polytechnic and Public Utilities Board. It is an annual event that has been held for 4 consecutive years. This year, the highlight of the festival is the Raft Race, whereby secondary and tertiary students build their rafts out of recycled material and row down a short course. They are judged based on innovation, creativity, and functionality. I reported at 1pm and was released at 4.30pm. There were no casualties. The Department of Student Development calls for first-aiders to be on standby just in case something happens. First Aid on Wheels at East Coast Park is a regular weekly initiative by Singapore Red Cross. volunteers set up a First Aid post at section C of East Coast Park every weekend to provide first aid to bikers, rollerbladers, anyone who happens to need it. the team consists of 2 roving teams, each on a route in either direction, and a stay-in team at the post. we each took turns to be part of the roving teams, and stayed in the post as well. majority of the casualty counts that day were abrasions and minor scratches, with no one needing to be evacuated. i'm looking forward to participating in this effort again, as i think it is a worthwhile effort, and the members of the public seem to appreciate it as well. while roving, a few bikers peddled alongside us to ask about our duties, and to thank us. i also received my Singapore Red Cross Passport today. we're supposed to record the days we volunteered for Red Cross duty, as a personal log, and get the team leader in charge for that day to cross-check and sign. i reported at the School of Business foyer at 1pm, as the only certified first aider on duty that day. the freshmen went out for flag day, so i was on standby. left school at 3pm without the need to attend to any casualties/injuries. today we went to volunteer at St. Luke's ElderCare. the staff were all foreigners from Phillipines and Myanmar, but there were local volunteers helping out as well. there were 3 elderly males who looked too young for their age. one was a 71 year old retired lecturer from Singapore Polytechnic, and he looks only 50+! same with a couple of other retirees at the facility. it must be the relaxed and joyful lifestyle they lead now. we did some morning warmups, art-and-craft, and exercise with them, and stayed to serve lunch. the elderly lady i paired up with has a kind of obsessive-compulsive disorder, but she was really kind to me. during the art-and-craft session, we were supposed to do paper weaving to create a rabbit card. i put my own personal twist to it by placing the cotton ball at the side as a tail instead of as a nose like everyone else did, and tore a triangular piece of paper as the nose/mouth. when we saw how i applied my creativity, she kept smiling at me and agreed that it was very cute. that made my day. while chatting with the clients during lunch, i started conversation with a retired lawyer, and what she said to a fellow schoolmate of mine made me glow with joy, but almost want to run away in embarrassment. she praised me as "warm, sincere, bubbly, and factual" among many others, after just a brief 10minute chit-chat with her about why some poly students sleep in class. if the facility was nearer to home, i think i may continue to volunteer there on my own, even without SPRC organising a community service trip there again. on Total Defence Day, our school organised a free CPR + AED course for us to register. at this 3-hour course, we learnt and practised the basics of CPR + AED, before taking the test. it was mainly a revision for me, and a refreshment of CPR + AED. these are the 2 most outstanding changes. in the end, every person at my station passed the test, and are expected to receive our CPR + AED certificate soon.